All you have to do is get in your car and try to drive around town and you will see for yourself that Boston is changing. There is so much more: people, cars, and, especially, construction. Buildings seem to spring up overnight, and often, you can be momentarily confused when a new glass tower suddenly blocks the view to an old familiar pathway. The experience throws you off; it takes some getting used to. We reason that building up means progress and that change is inevitable. The alternative is stagnation, a thought that conjures gloomy comparisons to Detroit, a city that is falling down. Lucky for us that Boston has cachet, and has been able, over and over, to reinvent itself. The latest transformation is as a 21st- century metropolis, and the waves of high-flying architecture across the horizon downtown seem to promise the arrival of a new class of citizens who are bound to possess a great wealth of sophistication. If, on the other hand, you prefer living more simply and closer to ground, then go to the neighborhoods, where you will find the people who make this city tick. Dorchester is the working-class engine that powers the city of Boston, in particular, the current construction boom. Evidence for that is the fact that 13 of the city’s 19 building trade unions are based in Dorchester. The unions operate training centers that keep up with the demand for qualified workers: bricklayers, carpenters, electricians, elevator constructors, floor coverers, laborers, pile drivers, plasterers and cement masons, pipe fitters, plumbers, sheet metal workers, heat and frost insulators – all are trained here in Dorchester. There was a time when instruction in the trades was part of a Boston public school education. Students were taught the rudiments, beginning in elementary school. Boys went to Wood Shop to cut and nail, while the girls went to Home Economics to cook and sew. 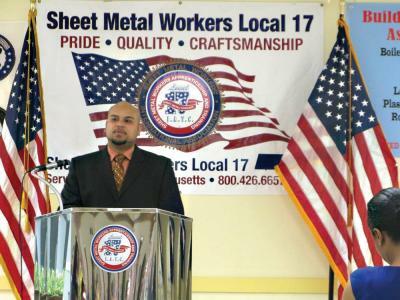 High schools specialized in the trades, Charlestown High School for electrical, and South Boston High School for sheet metal, are two examples. Also, there was Trade High School, and Mechanic Arts High School, later to become Boston Tech. By the 1970s, this type of education had just about disappeared in Boston. When well-heeled blue-collar workers lit out for the suburbs, the Voc Tech programs went with them. While many suburban communities joined together and invested in regional vocational technical high schools that are still thriving, in Boston, funding priorities shifted and costly programs were eliminated. Today, Madison Park Vocational Technical High School is the only public school in Boston that maintains shops to teach the trades. Also gone are outdated notions about gender-specific roles in the workforce. The women’s movement helped greatly to bring about that change, and in 1978, Jimmy Carter issued Presidential Executive Order No. 11246, allowing women membership in the building trades. At present, the percentage of women employed in the construction industry overall across the US is 2.5 percent. In Boston, the number is between 4 percent and 5 percent. Ms. Moir projects that number to be 20 percent by 2020. There were no special laws or executive orders mandating a certain percentage of minority representation in Boston’s construction trades until activists led by Chuck Turner pushed through the Boston resident jobs policy. In 1984, a guarantee of 25 percent employment of minority construction workers on Boston construction sites was adopted as the law by the city. Women of color are counted twice in the data on diversity in Boston’s construction industry, which has increased to 35 percent minority employment. What else is being done to account for that increase? One factor is that the employee pool is thinner now. More children and grandchildren of men from this industry are going to college and getting white-collar jobs, creating a shortfall in what was once the traditional pipeline to the unions. Another factor is the developers, who hire to “workforce participation requirements.” Diversity is part of the culture in Boston now, giving everyone in the community a chance to get a slice of the pie. But how can people get access to education that is going to teach them the skills that they need to join the trades and earn a higher salary? That’s where Dorchester’s training centers are working overtime, and that’s where the unions are making a big investment in social capital. For the past two years, the Boston Building and Construction Trades Council has sponsored a program dedicated to getting kids out of gangs. “Operation Exit” goes into the ‘hood to recruit at-risk youth and offers to teach them a trade. In effect, the training centers are throwing the doors wide open and putting everything on the line to give the youth a real chance for a new start. The teachers are dedicated to helping make a difference in people’s lives, but not everyone gets the idea. Nevertheless, it’s a gamble that promises substantial dividends. One success story is worth any number of failures. Begun in 2010, “Building Pathways” is another program that reaches into the community. Action for Boston Community Development (ABCD), the Boston Housing Authority (BHA), and the Building Trades Training Directors Association, are working in partnership on this pre-apprenticeship program, which provides six weeks of career exploration and hands-on exposure in the building trades, followed by placement in a union apprenticeship. Also in the mix are “Helmets to Hardhats,” a program designed to help veterans get back into the mainstream, and ABCD’s now seven-year-old Summer Jobs initiative for those aged 16 to 21. In addition to all of that, the training centers are always busy educating their own union members, who hail from all over eastern Massachusetts. An apprenticeship lasts for five years, with time split between instruction at the training center and work on a construction site (2,000 hours per year broken into 200 hours in the classroom and 1,800 hours on the job). Everybody is earning while learning, and there are step raises every year. When ready, the apprentice takes the Journeyperson’s state license test. About ten years after that comes the Master’s License test.